One hour from the city centre of Kochi, two Pachinko stores are either sides of the road and an old-looking sign of “welcome to Kure” looms over head. The day we visited, it was raining so heavily and loads of moored ships on the dark colored sea came into sight. Stepping out of the car, the first thing that hits you is the smell of the sea, the smell of a fisherman town which lets you know you have arrived in Kure. Kure is a small city in central-west of Kochi populated by less than 10,000. This area is Nakatosa town and the station of this area is Tosakure, however, people call this town “Kure”. Although it’s small, it has attractive places to visit, so many visitors come to see this town especially during the Katsuo (one of the fish which is famous in Kochi) festival or the fall festival. At these times there are more visitors than residents. This town faces to the Pacific Ocean and is surrounded by small mountains in the east and west and south of this town, which means there is plenty of nature from both the sea and mountains that the people love. He was wearing a white shirt and loose trousers and black boots, which reminded me a typical fisherman. Taishyo Ichiba, where many stores came into the one long roof, started about 120 years ago. In addition, that store which the man is working for was set up about 150 years ago. Urume is a kind of fish, sardine that you eat them dried and grilled. It used to be much more consumption, however, after 1940s, because marketing gets smaller and smaller, many companies which deal with Urume went down. The best days for Kure and its Katsuo fishery were from 1972 to 1976. Thirteen ships went out fishing at that time instead of just five now. Of course, the decline was everywhere after the best days. Nowadays, it is difficult to find new fisherman. They have four foreign fishermen, but it’s still not enough. 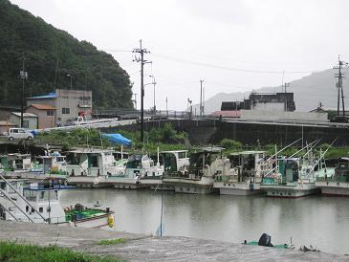 There is a tour that goes around Kure’s popular places, such as Taishyo Ichiba, Kuroshio Honjin, Kaze Kobou, and so on. Other small towns don’t have such kinds tours as the guy said. Kuroshio Honjin is a place that you can actually make smoked-Katsuo and many famous people have visited. In the big festival of Kure, ten to twenty thousands tourists come every year. In Katsuo Matsuri, people compete in pole-and-line fishing riding in a 20 meters long boat wearing costumes for fun. There are many local special dishes that people prepare for this day. There are lots of other excellent places to visit. These days, big cities are getting similar everywhere. Therefore, Kure might be unique and nostalgic Japan. Going around the town, there are many old-fashioned but cute things everywhere, which makes you want to take many pictures. A woman working at the cafe Kaze Kobou said, “please stay here as long as you want, it’s raining heavily outside” with the nice smile. Previous Ice Crin? Ice Cream? What’s the difference? I really like your article and photographs. Actually, I had read your article before while you were doing some work in my class and I thought it was really good, but your final product is much better. Well done. I like your photographs of Kure as well. Thank you for written about my hometown wonderfully! Please come my home town again!